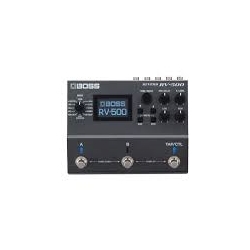 The power and versatility of BOSS's 500 Series digital effects pedals come to reverb in the RV-500 multi-effects pedal. Loaded to the brim with gorgeous-sounding reverb effects, the 12 onboard reverb types mean tonal adventurers will never run out of inspiration. And editing these sounds can be a straightforward affair or take tone tweakers down a deep well of options and sonic perfection. BOSS has a long legacy of lauded reverb effects, such as their RV-5's legendary Modulate mode and their COSM modeling of famed Fender spring reverb tones. The RV-500 is like your own personal library of all of these sounds in a single stompbox. Reverb is an absolute necessity on most electric guitar players' pedalboards these days. From covering ambient passages to the drippy tones only achieved through a spring-like setting, you're guaranteed to be called upon to wrangle these sounds. This makes the RV-500 an ideal partner for stage, studio, and home use. You'll find everything from warm-sounding room reverbs for a bit of extra ambience to highly effected SFX and shimmer sounds, all being processed through the pedal's astounding 32-bit/96kHz.